It’s our favorite time of year, and the fact that we spend more time with family and friends is a big part of why we love the holiday season. 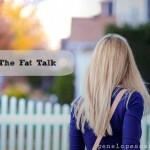 We have lots of parties and get togethers, and obviously, we eat a lot of food! Appetizers…well, we all know appetizers can make or break a party- they are the best part! Because I want to be part of the party, and not just serving the whole night, I now prioritize serving foods that are both delicious and require little work on my part, so I plan out foods and appetizers that are fun and easy. Chex® Party Mix is always a hit (at parties and on the road), and my favorite Chex® Party Mix can be made in less than 15 minutes. It’s a microwaveable recipe, so it can be ready, fast, for all our holiday party guests. The crunchy light squares come in a variety of flavors, six of which are gluten free (like the one in my recipe- check your label to make sure the one you pick is), and a single serving of Chex® cereal offers 12 grams of whole grains, so it’s healthier than most snacks too. My personal favorite flavor is Corn Chex®! 1. In a microwavable bowl, add butter, brown sugar and honey together. Microwave on high for 90 seconds and stir together until smooth. 2. Put Corn Chex® cereal in a bowl and pour sugar honey mixture over cereal. Stir together until well coated. 3. 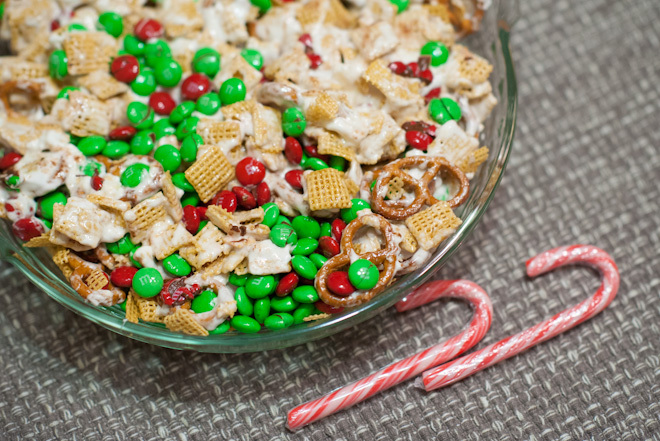 Add marshmallows, pretzels, and Christmas M&Ms to mixture and toss together. 4. 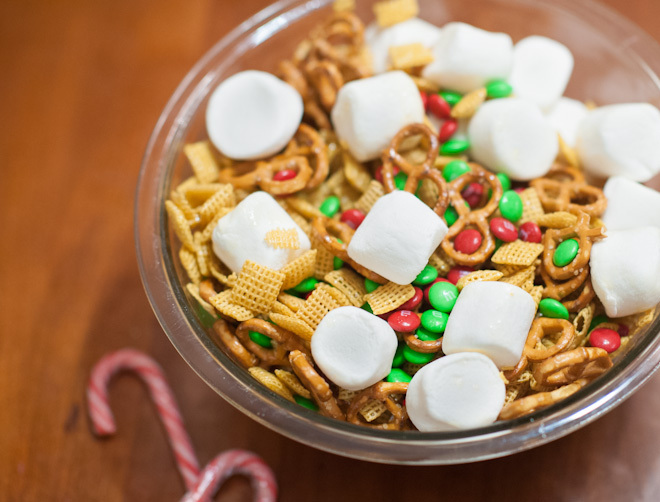 Microwave the cereal mix with marshmallows, pretzels and M&Ms for 2-3 minutes, until marshmallow is gooey. Stir together. It’s messier, but sooo good! Worth sticky toddler fingers! 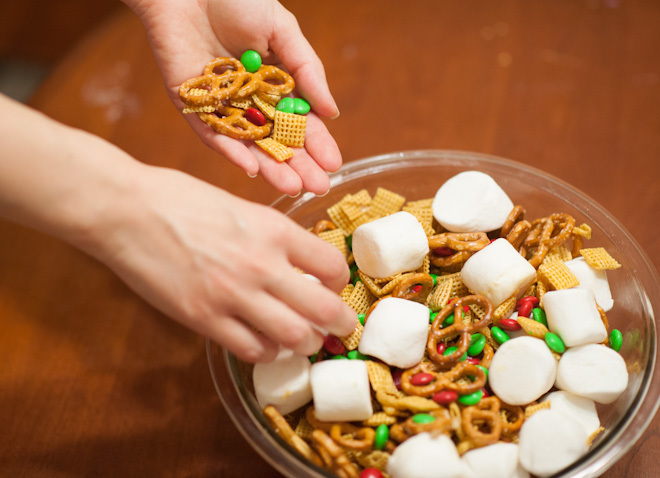 What is your favorite Chex® Party Mix? You can find lots of 15 minute microwaveable Chex® Mix recipes here. This post brought to you by Chex® cereal. I have been compensated and given free product for my time & commitment, but all opinions are 100% mine. I picked up a pumpkin spice Chex seasoning mix on clearance at Target – I really need to get on making that while the season of pumpkin is still here! I’ve never eaten Chex Mix anyway but dry, but I’m really wanting to try your recipe now! 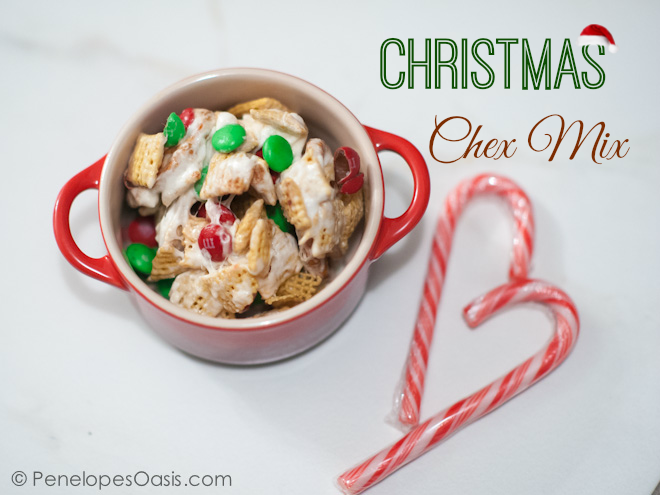 I’m loving finding new Chex Mix recipes! My kids will totally LOVE this! I love that you added marshmallows to this. 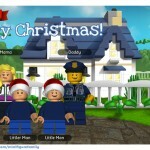 My son would have a blast making this with me. Pinning! OH WOW! I’m going to have to do this. This is awesome!!!!! I never would have thought to mix marshmallows!! Pinning! Oooo — I have a little boy that would be ALL OVER this thanks to those marshmallows! I seriously want to go to the store RIGHT NOW so I can make a big batch of this and snack on it at my desk all day. The basic Chex Mix is my fave, with the Worcestershire sauce…yum! I am actually making a Chex mix for our family party on Sunday! But mine is a little different, I use white chocolate. Yum! That ooey, gooey marshmallow sounds absolutely amazing in there. I would eat SO much of that yummy mix! 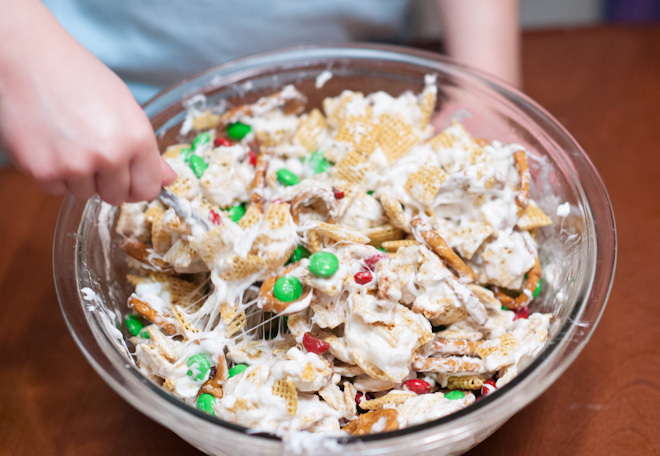 That’s a creative and festive recipe for Chex mix. Sounds and looks amazing, too! Yum! I’m totally making this! I love the sugar cookie chex party mix. It’s so amazingly good! Ooh yum! I love that the recipe is microwaveable, that saves a lot of clean up! I love how festive this looks Penelope! I haven’t tried that one yet, but it sounds really good! Sugar cookies!! That is a new take to chex mx!! I love it and looks super cute and really tasty!! This is so festive and delicious! Totally worth the mess. Oh boy, that would not last long in this house, it looks so yummy and festive! That is certainly a delicious gooey mixture! I’m a sucker for Chex mix and really enjoy taste testing new combinations. My husband and kids love Chex Mix. I’ll have to make this for them soon. I’ve had this before, it’s delicious! I love chex mix on its own but love the idea of the additions 🙂 Can’t refuse improvements! I love check party mix. I love to make it for the holidays. It’s the perfect easy treat to make. I like that there is no Peanut Butter in it. I think I wouldn’t heat it up and just let it be a mix, without the gooey factor. Oh that looks amazing and so easy to make. I love treats that have the salt/sweet they are definitely the best. This looks incredible, something my kids would eat WAY too much of. 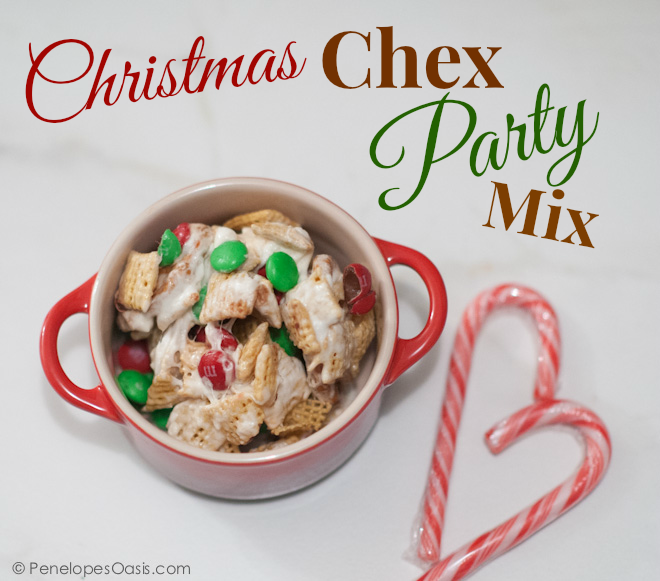 I love how Chex party Mix recipe can be made to suit the flavors you enjoy. YUM! This would be perfect for all holiday parties!